Over the past couple of years I've shared my own minimalist journey every Monday on the blog, and most recently in my minimalist book series. But what I really enjoy is seeing how others have achieved a minimalist lifestyle, whether it be organizing their pantryor downsizing and moving on to a boat. A couple of months ago Alison emailed me about her own path to becoming a minimalist and I just had to share it! 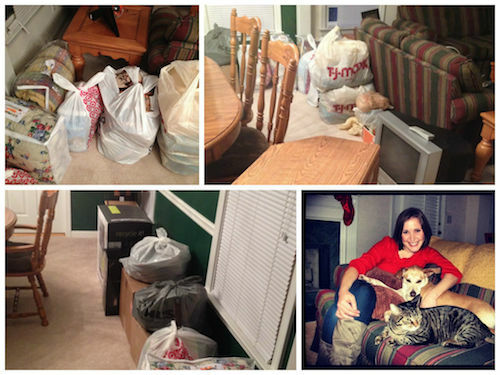 Hopefully her story will inspire you to do a little decluttering today. Minimalism has recently become a way of life for me. Friends and family have jokingly questioned if I'm giving away my entire life's possessions, and have asked if my husband is next to go - let's face it honey, less is more. I admit that I've become cuckoo for no clutter. But the clarity I've felt as a result of de-cluttering has been incredibly rewarding; I feel more at ease and more peaceful without all of that stuff lingering around. I whole-heartedly agree with Lindsay when she says, “Consumerism leads us to believe that more is better and that whatever we have isn't enough. This is a prescription for disappointment. This kind of thinking leads to unhappiness and you have to reject that thought pattern to begin your minimalist journey." Before I started reading Lindsay's blog, I always thought of myself as a minimalist by throwing junk mail in recycling immediately or making sure everything was organized and had a place in the house. I couldn't have been more wrong. When I saw how a true minimalist lived, my world changed - oh my gosh, how did Lindsay get her kitchen counters so bare? I've learned so much by reading Lindsay's "Minimalist Monday" posts and her first book on minimalism. One of the biggest takeaways for me was to keep the mentality that I was giving away items to others who need them and would use them more than I ever would. Lindsay says in her first minimalist book, “Minimalism has taught me over and over again that I am not my stuff. My memories are also not under my bed, in the attic, or in the closet. They are in my heart.” I was holding onto things that I thought I might use in the future, like clothes for Halloween costumes or books that I might read again. Instead of using my house as a storage space for the "what ifs," I followed Lindsay's sound advice: if I’m not going to use it today, then get rid of it. She also provides a simple yet genius rule: one in, one out. If I’m going to buy something, I need to be sure to give something away. Otherwise I was going to land myself right back at Clutterville. Learning about minimalism through Lindsay's blog had come at a really great time. I had just started reading "The Heart of the Buddha's Teachings" by Thich Nhat Hanh. I was studying how to be more mindful and live in the present moment when I realized that mindfulness and minimalism go hand-in-hand. Reading both Lindsay’s and Thich Nhat Hanh’s books were incredibly helpful in laying the groundwork for my minimalist journey. Creating a zen environment didn’t happen instantly or naturally. It took practice and is still forcing me to think differently about the world and my place in it. The day after I finished Lindsay's book on minimalism, Atlanta was hit by a huge snow storm. Instead of plopping down on the couch and binge watching Downton Abbey like I normally would have done, I decided to de-clutter. I spent three days of going through our belongings, which resulted in me and my husband boxing up a lot of our possessions to give away. Lindsay explains, “You have to realize that the keyword in possessions is possess and that possessions possess you.” I was ready to let go and not let my stuff control my life! 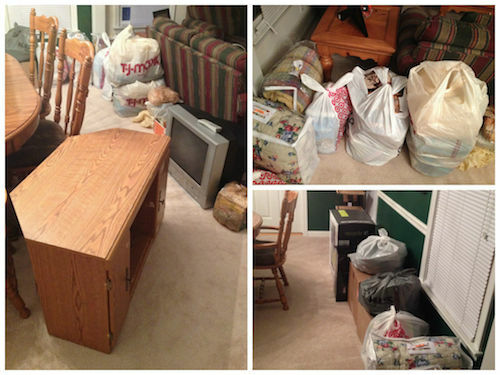 My husband and I gave away the following: 100+ books, DVDs and CDs to the library; 10+ bags of clothes to GoodWill; boxes upon boxes of various items for my friend’s garage sale that helped with adoption costs for her baby; 6 large bags of sheets, towels and comforters to the local animal shelter; and I finally returned Tupperware, books and cookbooks that I was hoarding to their rightful owners. Surprisingly, there is still more to give away! I took a break from de-cluttering after the big purge, but I'm feeling like it's time to start on another minimalist project. I agree with Lindsay when she says, “My approach to minimalism is about living with less and enjoying what I do have.” It's amazing how I felt a great burden lift off my shoulders when I started on my minimalist journey, and it's reassuring to know that it'll just keep getting lighter as I go, creating a space around me that offers peace and positivity. 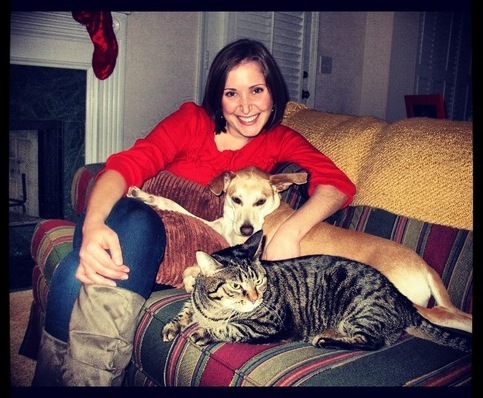 Alison Mercer lives in Georgia with her husband and their adopted dog and cat. Alison is the director of annual programs for a higher education institution, and has been in the fundraising field for the past ten years. In her spare time, Alison enjoys writing about vegan recipes and animal rights issues on her blog,Running on Vegan; attending her local vegan book club; running and training for 10Ks and half-marathons; and serving as a board member for bothOur Hen Houseand her local animal rights organization,Georgia Animal Rights and Protection (GARP).